When Candyman was released in 1992, Roger Ebert gave it his thumbs up, remarking that the film was “scaring him with ideas and gore, rather than just gore.” Indeed, Candyman is almost unique in 1990s horror cinema in that it tackles its sociopolitical themes head on. As critic Kirsten Moana Thompson has remarked, Candyman is "the return of the repressed as national allegory": the film’s hook-handed killer of urban legend embodies a history of racism, miscegenation, lynching, and slavery, "the taboo secrets of America’s past and present." In this book, Jon Towlson considers how Candyman might be read both as a "return of the repressed" during the George H. W. Bush era, and as an example of nineties neoconservative horror. He traces the project’s development from its origins as a Clive Barker short story ("The Forbidden"); discusses the importance of its gritty real-life Cabrini-Green setting; and analyzes the film’s appropriation (and interrogation) of urban myth. The two official sequels (Candyman: Farewell to the Flesh  and Candyman: Day of the Dead ) are also considered, plus a number of other urban myth-inspired horror movies such as Bloody Mary (2006) and films in the Urban Legend franchise. The book features an in-depth interview with Candyman’s writer-director Bernard Rose. 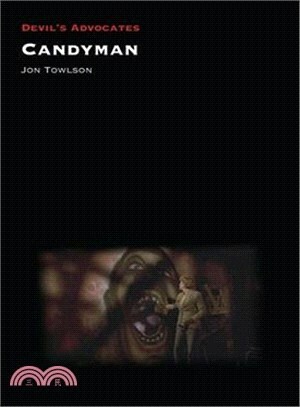 Jon Towlson is the author of The Turn to Gruesomeness in American Horror Films, 1931-1936 (2016); Close Encounters of the Third Kind (Auteur, 2016); and the Rondo Hatton Classic Horror Award-nominated Subversive Horror Cinema: Countercultural Messages of Films from Frankenstein to the Present (2014).